The Metropolitan Water District re-votes on their plan to finance the majority of the $17+ Delta tunnels plan tomorrow. Over the weekend, I reviewed the information MWD staff prepared for their vote, along with the new Sacramento-Delta report released by the State Water Board on Friday that is likely to substantially reduce the water supply benefits of the tunnels. After Friday's release by the State Board, I would add to the top of this list an analysis of how the State Board's Sacramento-Delta framework will affect water supply from the tunnels. The Delta outflow recommendations in this new document would reduce diversions from the Sacramento/Delta watershed by an estimated 2 million acre feet per year compared to existing conditions (with or without the tunnels). Not all of that would be the responsibility of the SWP and CVP, but the document does state "The Projects (SWP/CVP) would bear a significant portion of that responsibility since they are the largest, most junior diverters in the watershed..."
These new outflow regulations will have major impacts on this slide that has been at the heart of the MWD staff argument that WaterFix is a good investment. MWD staff's "Future without CA WaterFix," cuts Delta exports by 1 maf over "Existing Conditions." This future scenario looks more likely now, and it would go a long way towards meeting the Board's proposed outflow requirement that would cut diversions by 2 maf. On the other hand, it is pretty much impossible to see how the "Future with CA WaterFix" scenario could occur and meet the outflow requirement of the Board. As mentioned above, the Board says "The Projects would bear a significant portion of that responsibility" but under this Future with CA WaterFix scenario, the Projects would increase diversions compared to Existing conditions and wouldn't be contributing anything. Thus, the new Sacramento/Delta outflow rules are likely to push the bar on the far right (water exports with the WaterFix) down, and thus will push the estimated water yield from the tunnels way down and the difference between these two bars should be much smaller. I would argue that the EIR/EIS project yield of 0.2 maf looks like a better assumption than staff's 1.3 maf of water yield. As the yield declines, the cost per acre foot rises rapidly and WaterFix becomes a worse investment for MWD. The MWD board would be well advised to redirect the billions they would invest into WaterFix into alternative projects that will yield more water per dollar invested while furthering the state's goal to reduce reliance on the Delta. Finally, I should mention the two changes in what MWD staff has provided to the board in the July 10 packet compared to the April 10 vote. First, the July 10 agenda does not include a single-tunnel option for the board. Staff says this is no longer an option, pointing to a letter from a Department of Water Resources lawyer saying DWR is no longer considering a "staged" single-tunnel plan. The MWD Board should not accept that flimsy dismissal of the single-tunnel option. DWR only said that because the MWD board voted to finance the 2nd tunnel on April 10. Should the MWD board rationally choose not to fund both tunnels now, a one-tunnel plan will be back in consideration. For precedent, look at what Santa Clara Valley Water District did last fall - they voted to support a single-tunnel concept when there was no single-tunnel proposal - and suddenly that became the plan. 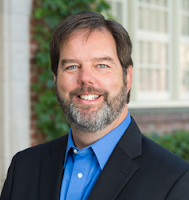 The real concern is the time pressure created by the end of Governor Brown's term. It is probably true that the twin tunnel proposal will die if it is not approved before the end of his term, but I don't think the same can be said of the urban, single-tunnel option. As I recall, Gavin Newsom has said that he supports the concept. While I think no tunnel is the right answer for California, I would agree that single-tunnel is a better and less risky option for MWD than this "unsubscribed capacity" two-tunnel strategy. 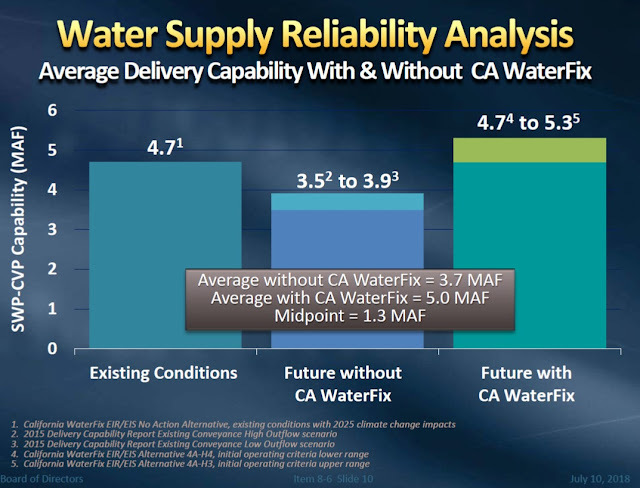 The second important change to the July 10 packet was a new estimate of the additional water supply MWD could get from the 3,000 cfs unsubcribed capacity if CVP did not lease it from them, 150,000 af. Staff had not been clear about this before, and it seemed like some board members thought they would get 433,000 af in additional water supply if CVP didn't lease capacity (the same benefit estimated for CVP), but this extra capacity would deliver about 1/3 the water supply benefit to MWD than it would deliver to CVP. Financing the unsubscribed capacity would increase MWD's cost for the tunnels by more than 100%, while increasing their water supply benefit by less than 20% at best (perhaps nothing at all given the state board's newly announced plan for increased outflow). MWD staff's plan to fund 65% of the twin-tunnels is a bad deal that keeps getting worse for MWD ratepayers. Fortunately, MWD board members have another opportunity to vote and they have plenty of good reasons to change course.